[Abstract] At present, supermarkets have gradually become the mainstream of commodity sales, how to carry out the packaging of supermarket products? In response to this problem, this article from the supermarket commodity packaging should follow the simple, scientific, environmental protection and other aspects to start, to the super The market's commodity packaging has been discussed, and the simple, scientific, and environmentally friendly packaging will be the development direction of supermarket packaging in China. In August 1930, American Michael Cullen founded the world's first super market, a Cooper Supermarket. At that time, the United States was in a period of economic crisis and the market economy was very sluggish. However, the supermarket had a major breakthrough in low prices. And the success of liberating consumers from the stress of selling in a radical manner has been a great success. Supermarkets, a new form of retail business, are based on the market in the form of self-service, small profits and quick sales. In the form of commodity sales, from the traditional department store formats in the 20s and 30s in Europe and the United States to the chain retail business in the 1960s and 1970s, to the supermarket model, the store model, and its sales model in the mid and late 1970s In the course of evolution, development, and maturity, the existence of various commodity sales forms has made the competition of enterprises increasingly fierce. However, from the perspective of the company's long-term strategic development, the supermarket model will be the mainstream of the development of the retail terminal market. In the development of China's retail industry, the history of this type of supermarket existence is not very long, but it has won the consumers' favorite with its unique operating charm. At present, the number of supermarket enterprises in China continues to grow, and the competition between the same industry and other retail formats has become increasingly fierce. With the entry of foreign supermarkets such as Wal-Mart, Carrefour and Tesco, market competition will increase. More intense. A supermarket must be invincible and requires strong competitive tools, including supermarket development strategy, image marketing strategy, merchandise marketing strategy, promotion strategy, service marketing strategy, development marketing strategy, etc. This kind of service provides customers with the goods they need through information feedback to improve the product composition and make it more suitable for customers. Some products have packaging. Packaging is a means of marketing. It plays a role in protecting the goods, facilitating transportation, easy identification, communication, reflection of culture, and promotion of sales. Supermarkets are a form of puerile. Product packaging has its own unique requirements. To adapt to the international development trend of the retail industry, China's packaging industry must unite with the commodity production industry, seriously study the characteristics of supermarket product packaging, actively learn the experience of foreign supermarket packaging, and intensify the transformation of supermarket packaging. So, how to do a good job in the packaging of supermarket goods, the author proposes to start from the following aspects. Nowadays, boxed eggs, boxed fruits, delicately packaged vegetables with green food signs, and agricultural and sideline products from different origins have become hot commodities in supermarkets. These commodities that are closely related to people's lives are used almost every day. However, many supermarkets sell their products in bulk or in piles. They do not say that air pollution causes harm to products, but both are There is no production date, no shelf life, such goods you will feel comfortable eating it, and after buying the goods you use too much plastic bags, which is a pollution to the environment, there are reports that a citizen to the supermarket bought more than 100 Yuanâ€™s merchandise, after returning to clean up large and small plastic bags there are more than 20, he said: â€œMy family has never bought a special garbage bag, just use a plastic bag from the supermarket can not be used. We do not talk about the supermarket To find out how much it costs to do this, from the point of view of environmental protection, will these plastic bags cause environmental pollution? (7 It is actually very simple. If you go to large supermarkets such as Wal-Mart and Carrefour, you will find food, oil, egg and other agricultural products. The by-products not only have a simple package, but also clearly indicate the brand name, date of manufacture, etc. on the label, and the price is not much different from the bulk product packaging. As for the packaging and branding of commodities, they already have a certain amount of ideological preparation and material bearing capacity, that is to say, supermarkets should start from simplicity, sell products in simple packaging, and establish a brand for their own products. As the level of consumption continues to increase, people need to be able to identify such easily identifiable signs as packaging and branding on the shopping day in order to repeat the purchase of their favorite products many times. Invisible, it also plays a role in the brand sales of the goods. Egg and egg products are packaged in egg-shaped containers in a transparent plastic box, and then affixed with their own brand labels, with manufacturers, addresses, and production dates, etc. Egg-shaped containers can ensure the integrity of the goods, transparent plastic box In addition, products can be seen directly, and this form of packaging should be worth promoting in supermarkets.Since January of this year, the "Code for the Management of Bulk Food Hygiene" issued by the Ministry of Health has begun to implement, requiring that all supermarkets and shopping malls must comply with hygiene standards. The required packaging materials and containers are sealed and the label is marked with the name of the food , ingredients list, producer and address, production date, shelf life, storage conditions, usage methods and packaging specifications, together with proof of inspection, therefore, bulk foods will gradually fade out of sight, so as not to increase the cost of supermarket product packaging. Simple packaging will be feasible for the sale of supermarket goods. Supermarkets are in a special position in marketing. On the one hand, they are the manufacturers' distribution channels. On the other hand, they are their own marketing subjects. Supermarket marketing has its own characteristics. In recent years, some producers of food and daily necessities have begun to research and develop a series of packages that are applied to consumers' requirements in response to the unique sales situation of supermarkets and the characteristics of consumers' requirements for product packaging. For example, children's daily necessities are accompanied by cartoon packaging of animals and film characters so that they can use the product packaging like a toy after they have used up the goods; packaging for the elderly should be equipped with safety, durability, and economy to meet the needs of the elderly. The need for reasoning; for young people, men and women are scientifically packaged for different hobbies such as colors and object shapes. These targeted and scientific packagings are adapted to different levels and types of consumer products. Packaging requirements, but also to the characteristics of the package itself sales. Nowadays, with the rapid development of supermarkets, fresh product operations have become commonplace, and how many businesses have not considered packaged fresh products, there are merchants for their packaging, which also adds a weight to the competition, taking into account the health Ministry of Health requirements for bulk foods, in the packaging of fresh food can consider the use of waterproof new type of paper bag packaging, and then the scientific knowledge of fun and fresh food recipes printed on the packaging, make their own brand, on the same day Can also consider a variety of different levels of packaging for different levels of consumption, so that the low cost of packaging, but also can play a certain effect. The connotation of packaging culture is very rich, and it is an intangible asset of production and management. While he is infiltrating the culture of the public, he also embeds the impression of his brand into the minds of consumers, and is suitable for the packaging of supermarket commodity consumption. It should follow the scientific Packaging trends. At present, with the continuous influx of foreign large supermarkets, the arrival of global economic integration, the influx of foreign food and agricultural and sideline products, and the large-scale export of domestic products of this kind, the market competition is becoming increasingly fierce. To compete for the market, many foreign food production Enterprises and agricultural and sideline products processing companies are striving to make the products of high quality and low price, while emphasizing the same differences and features of product packaging in the same important position, scientific and rational commodity packaging has become the only way. At present, with the aging of the population in China, the elderly as a consumer group can not be ignored, and actively develop and manage the packaging of elderly products has become more and more potential, such as product packaging variety, small-scale, like agricultural and sideline products, 1kg, 5kg, etc. Small packaging should also be more and more; at the same time pay attention to longevity, physical fitness healthy green food scientific and rational packaging; to provide easy-to-carry packaging, etc., are the active development of the elderly market. The packaging of commodities brings convenience, hygiene, and safety to people's lives. At the same time, it also generates a lot of waste of resources and environmental pollution. Supermarkets, as a convenience store for fast-selling everyday items, will have a higher frequency of consumer visits and produce a wider range of environmental pollution. The pollution of the plastic bag mentioned earlier, almost all families have this experience, there is simply a garbage bag. According to statistics, "white pollution" is the most widespread and most serious form of contamination in packaging products. Therefore, some large supermarkets such as Carrefour and Zhongbai Supermarket do not encourage people to use plastic bags for shopping and use plastic bags for the same day. In the packaging of supermarket products, it is closely related to us. It is also a common environmental pollution that is the packaging of instant noodles. The bottom of the bowl of instant noodles is marked with â€œPS has PP, and Ps and PP are polystyrene and polypropylene, respectively. They are all safe. Can be assured that eating, should pay attention to the foam plastic bowl, the bowl material loose (with foaming agent), if you use boiling water foaming, foaming agent ammonia compounds, it will escape, very harmful to the human body, at the same time There is also a lot of pollution to the environment, as well as common bagged biscuits. For convenience, some merchants pull polyethylene into a film and mix industrial lubricants inside. After such cookies are sealed, they produce a plastic. Taste, will have adverse effects on the human body and the environment.How to package the goods? (7 to the manufacturer of a proposal, "a paper to plastic," the paper pollution JJ, easy recycling, but also can be reused, is a modern commodity packaging The beneficial material. Although the packaging of supermarket goods has high and special requirements, it is basically consistent with the requirements for commodity packaging in the entire commodity circulation field. At present, the influx of foreign large-scale supermarkets has made China's retail industry an international trend, Normat's global procurement strategy, information-based distribution system, and marketing strategies that are affordable every day, and scientific and rational packaging. The industry is a classic case. If China's packaging industry wants to adapt to the international development trend of the retail industry, the simple, scientific and environmentally-friendly packaging will be the development of supermarket packaging in China. Whoever attracts a large number of consumers will be invincible in the competition. Currently, Artificial Turf has been well-known and widely used in the sports centers, commercial squares, green parks, gardens, as well as the roof decoration, it is beautiful and environmental-friendly. 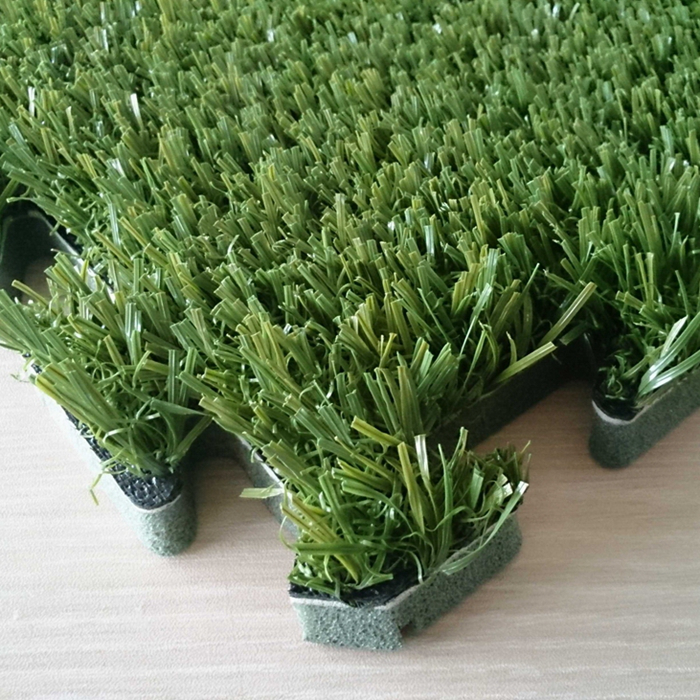 interlocking Artificial Grass tile, a patented product and masterpiece of City green, it is incorporated with both artificial grass and plastic tile base, and with the popular size, making the grass freely detachable, combinable and removable, meanwhile easily set up onto the ground as movable activity areas or leisure places.